Your account allows you to give you access to save/bookmark listings, create saved searches, adjust your preferences and send us messages. If you need any assistance, please contact us by email or call us at 941-923-7777. Click the My Favorites & Dashboard link at the top of the page while logged into your account. Here you can adjust your contact information and email preferences. Select My Messages to create a message or view our replies. 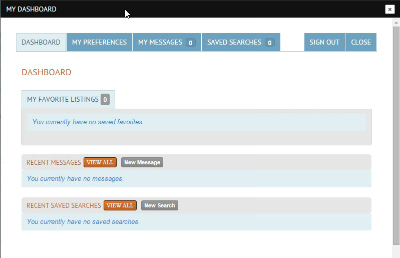 Select the Saved Search tab to view, edit and delete you saved searches. Bookmarked listings are listings that you want to save and view later. To Bookmark a Listing click the star icon near each listing result or the Bookmark Listing button found on each listing's details page. If you find yourself searching for the same types of properties all the time, you needn't fill out the search form each time--create a saved search for one click access to search results. To create and Save a Search Click the "Save this Search!" link found at the top of any listings results page.